Today I’m welcoming my sweet friend Dena from Back to the Book Nutrition to share with you a recipe that quite frankly, I never would have thought of making! I met Dena a couple of months ago through another friend (who is also a blogger) and I was in awe when she shared her story with me. Her desire to follow God and the path He has in store for her inspires me, and her recipes make me wish I could lick my computer screen! I hope she had the same effect on you guys. So, enough blabbing from me. Without further ado, here’s Dena! Thanks to Tiffany and all of you in the Crumbs Community for having me over for a visit today. I’ve been a regular reader for a while now, so I’m thrilled to be able to share one of my recipes on such a fantastic site! When Tiffany and I spoke recently about ideas for this post, I was shocked to hear there wasn’t a single popsicle recipe on the Crumbs web site. 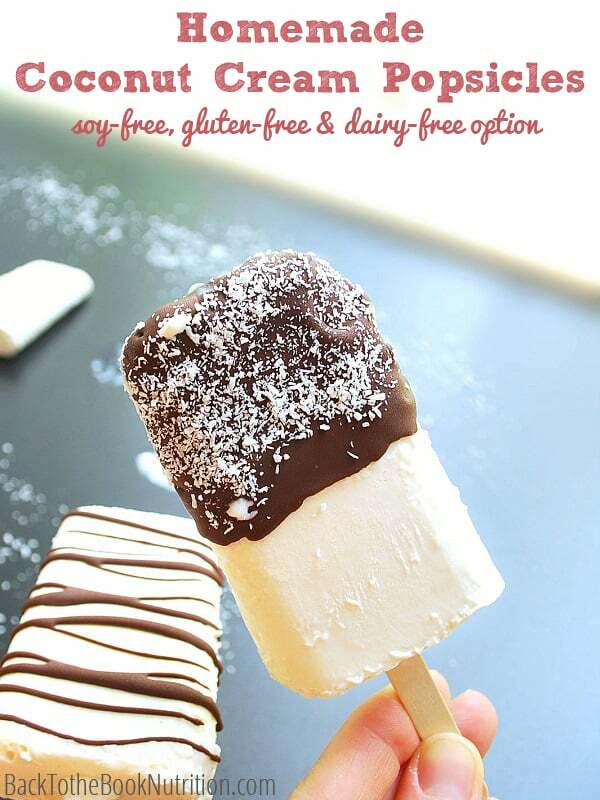 Me: What do you think about a coconut popsicle recipe for my upcoming guest post on your site? Tiffany: Oh, that would be great! I don’t think I’ve ever posted popsicles before. Me: (Did she just say that?) Um…never? Tiffany: It doesn’t get hot enough here in California, so I just never make them. I guess the benefit of making so many pops is that you come up with some real winners, like homemade Peach Mango Berry Swirl Pops or irresistible Chocolate Covered Banana Pops. Both are healthy, cheap and irresistible! We even use my homemade “Mombucus” immune syrup to make surprisingly delicious Elderberry Juice Pops to help fight off summer colds. It’s WAY cheaper than buying elderberry syrup from the store, and the pops taste great! But today, I’m sharing a new recipe for my very favorite homemade popsicle yet – Coconut Cream Pops! As a bonus, these are soy and gluten-free, can include a dairy free option – hooray! Combine first 4 ingredients in a mixing bowl. Add a pinch of sea salt, or more to taste. With frozen pops still in the freezer, prepare the chocolate "shell" coating by melting chocolate and coconut oil in a small sauce pot over low heat, stirring constantly until just melted (or in the microwave for 15 second intervals, stirring between each). Removing one pop at a time from the freezer, hold it over the pot of melted chocolate and use a small ladle to drizzle or pour the chocolate over the pop. Quickly transfer the pop back to the lined board in the freezer. Sprinkle with additional flaked coconut if desired. Store pops in freezer until ready to eat (cover if storing longer than a few hours). Allow to sit at room temperature for a few minutes before serving - just long enough for the creamy coconut to soften, but the crispy chocolate shell to remain frozen. Enjoy! The only down side to these sweet treats is that they’re a little pricey – coming in at just over $1 for each chocolate dipped bar, or just under $1 without chocolate. The sans-chocolate variety is similar in price to the premium line of organic “Coconut Bliss” bars sold at high-end grocers. The trouble with Coconut Bliss is that they’re sweetened with agave, something I try to steer clear of since agave is a highly refined product that is metabolized similarly to high fructose corn syrup. 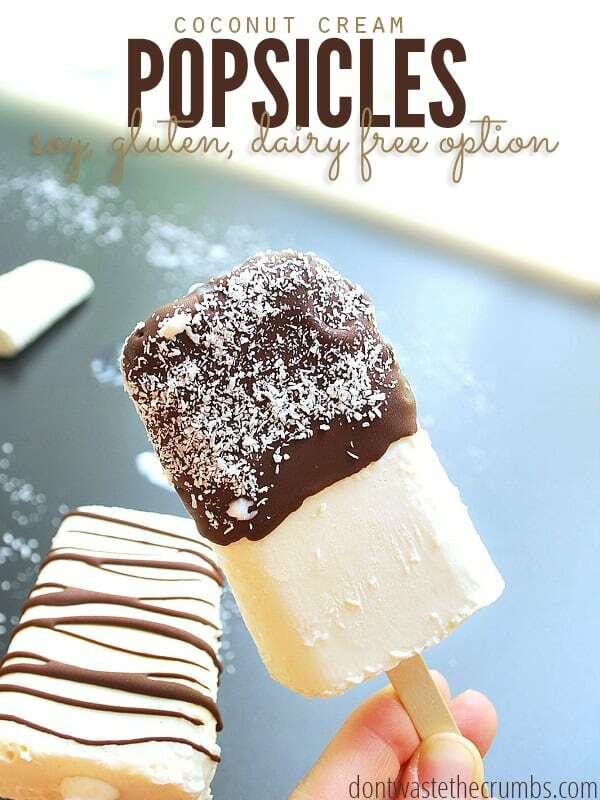 Cheaper coconut pops can certainly be found, but in my experience, they aren’t as creamy as these and aren’t chocolate dipped either (a big drawback in my book!). Plus, you won’t find organic or non-GMO ingredients in the less expensive products. Skim Milk, Sugar, Coconut Cream, Coconut, Cream, Natural Flavor (Contains Soy), Guar Gum, Xanthan Gum, Carrageenan, Carob Bean Gum, Natural Flavors, Dextrose. Sometimes, splurging a little on a decadent treat you can feel good about eating and feeding your family is worth it, right? Need more healthy summer treats? Surely we’re not the only ones who enjoy popsicles, right? What’s your favorite homemade popsicle recipe? I’d love to hear about it! They may be a bit pricey, but they look absolutely amazing! You certainly could, Melanie! Honey has a stronger flavor than maple, so you might try starting with just 1-2 Tbsp, and adding the third only if it suits your taste. Well, I don’t mind making a more expensive treat if it means my boys will feel like their sweet tooth is satisfied without sugar and junk! Plus I am sure we can find things on sale to lower the price!! This looks deliciuos! We are currently on the Daniel Fast (which is how I came across the Crmbs and I love it!) I think this will do great for a sweet treat and my girls will really love them as well! I get fresh cocinara here si I was wondering if you can tell me how to substitute the fresh, kind of mushy cocunut instead of shreded? Could I make the coconut milk from this also?thanks so much! Hi Rosa. It’s wonderful that you’re using fresh coconut! I think you could probably substitute use the same amount of the fresh (“mushy”) coconut as is called for in the recipe (1/3 cup). 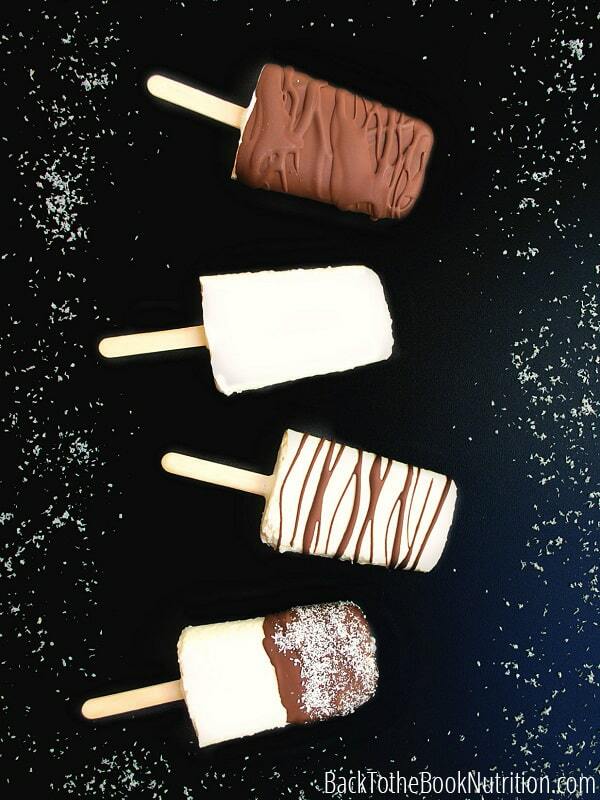 It might even give the pops a little creamier texture! I’ve never made coconut milk from fresh coconut myself, but Nourished Kitchen has a great tutorial here: http://nourishedkitchen.com/how-to-make-coconut-milk/. PS – I’m so glad you found Crumbs! Welcome!! These look lovely! I don’t have pop holders so I’ll use my mini ice cube trays. I don’t have maple syrup on hand so I’ll use coconut sugar, Instead of coating with chocolate, to save time I’ll drop in some chocolate chips and we’ll see what happens, yum! Thanks! If you were to buy something similar it would be closer to $2 each. I think it’s possible to make it less expensive if you have a high power blender and make your own coconut milk. Ooh, great point about the savings from DIY coconut milk – thanks for throwing that into the discussion, Tammy! Can I substitute almond milk for the coconut milk? I wouldn’t Kathy – you need the fat from the coconut milk to make these creamy. They are delicious! I am dairy free for medical reasons and I loooove ice cream. It’s my Achilles heel… I was scouring the internet for a delicious alternative and found your recipe. I made them today. YUM! I didn’t have the enjoy chocolate chips on hand so I just added a little cocoa powder to the recipe for a hint of chocolate flavor. I put them in cups to eat with a spoon after they were frozen and man oh man…I could have easily eaten them all! So delicious! Thank you so much for sharing this.